Enjoy a lasting energy boost after a workout in our WestinWORKOUT Fitness Studio, or relax by our serene rooftop pool. Nourish yourself with modern American comfort food at our famous Todd English P.U.B., featuring sleek d cor and tasty microbrews.Centrally located next to the convention center in the Uptown Entertainment District, we're conveniently located beside endless attractions, from the Alabama Sports Hall of Fame to the Birmingham Museum of Art, Birmingham Civil Rights Institute, and Regions Park.Guests will experience a refreshing retreat infused with traditional Southern hospitality and design. The hotel comprises 294 guest rooms, including seven suites, all with the signature Heavenly Bed and Heavenly Bath. 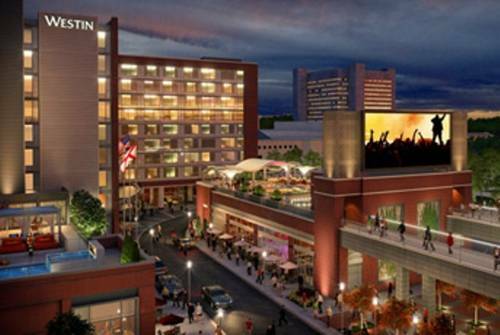 The Westin Birmingham is conveniently set in the Uptown Entertainment District at the Birmingham Jefferson Convention Complex, home to numerous meeting and exhibition venues, a large arena, and multiple performing arts theaters. During a break from business, stroll through Arlington Antebellum Home & Gardens or take in a show at the Alabama Theatre for the Performing Arts. Younger guests will find plenty to engage them at the McWane Science Center or The Birmingham Zoo both just a few miles from the hotel. Sports, entertainment, and cultural events abound throughout the city. Uptown destinations like the Birmingham Museum of Art are within walking distance, while the Birmingham Civil Rights Museum, Rail Road Park, and Regions Park home of minor league baseball's Birmingham Barons are just a short drive from the hotel. Other interesting nearby sites include the National Historic Landmark of Sloss Furnaces site of Birmingham's original iron-producing blast furnace and the Southern Museum of Flight.